This post is meant to show and explain what a user's initial authorization experience might look like. Keep in mind that this is a user experience example only and the SimplyTapp Mobile SDK has already been integrated with the user's third party app. The following post will take you through the initial authorization process and explain what is happening along the way. 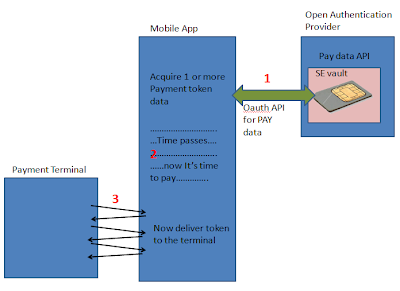 At the end you will have a independent third party app that will be loaded with one authorized payment card and will be ready for "tap and pay" use at contact-less terminals, like McDonald's. The picture below illustrates what the user experience would look like from within the app. The process is based on existing Open Authentication standards. The application must first ask the user if they would like to approve the application for making payments with a payment card at a P.O.S. terminal. * Any SimplyTapp branding is purely for demo purposes. Branding would be replaced by issuing entity. 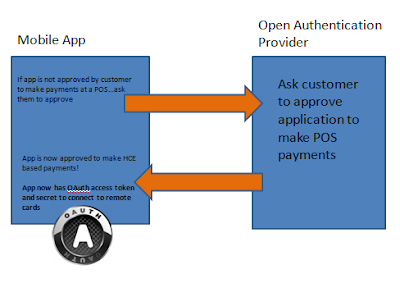 In the back end this is the process that goes on; The box on the right side is typically a browser that verifies to the user that the application is authentic and that the application would like to ask permission to present payment cards as a form of payment at a P.O.S. Upon user approval, the application will ultimately end up with an access token and secret that can be used only to allow transactions against a remote card, but not manage the card itself. After you have successfully logged in and authorized the application you will be brought from the browser back to the mobile app. You will be prompted to create a new 4 digit pin. 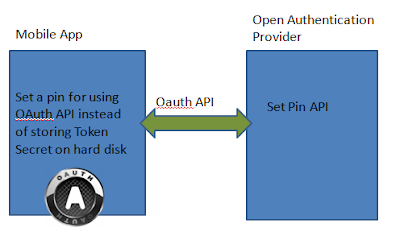 This pin is for our newly added payment functionality and can be used instead of storing any Open Authentication secrets on the handset itself. The pin is never stored locally on the handset and is used as a quick password entry. At this point the mobile application is approved by the user to make point of sale payments with any cards that it may contain. The app itself does not contain any cards yet as the customer has not applied or registered for any digital cards. 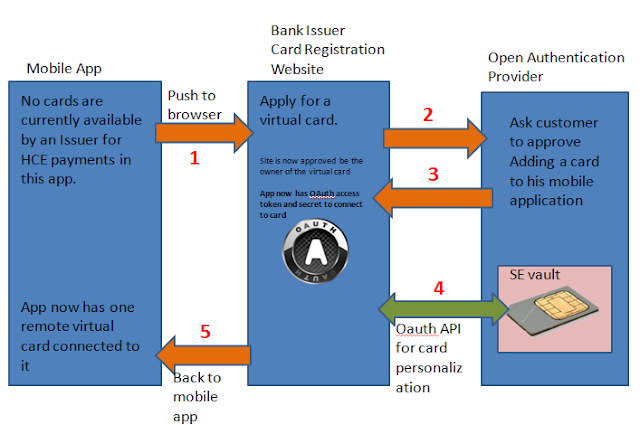 In a similar process, the user is made aware that the app currently has cards available, but the user must apply for them. Once a payment card is acquired, you will view and navigate app as normal. In this example we can check balances and manage our money exactly the same as before with app. The payment feature can happen in the background by simply tapping the phone to a payment terminal at any given time. Below are the logs from payment process happening on the back end.. These logs are part of the U.I. from the SingleCard app. 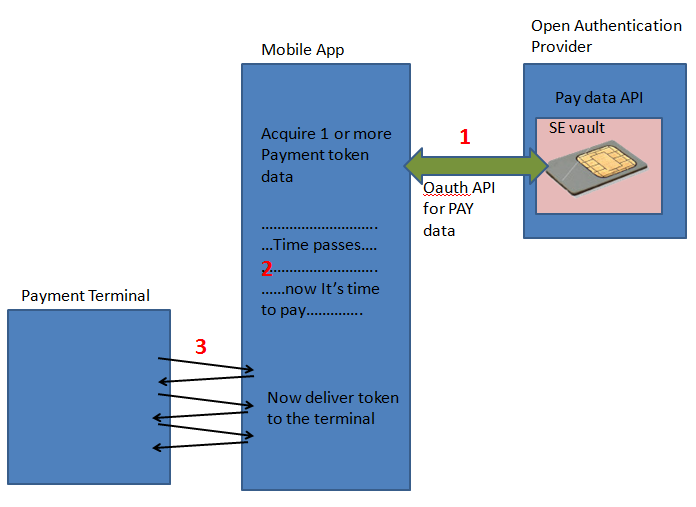 This example app is now fully authorized and ready for secure contact-less NFC payments. I would like to appreciate all your efforts, I have used many other services several times and I am very happy with it too. Finally once more thank you for this breathtaking article and I like this. I hope this will be very helpful to the students to complete their educational works related with the topics here. This post is one of its kind as I can't find more satisfying post than this anywhere on internet. So much helpful and explained in easy way for students to easily grasp the concept. These spy apps for iphone would be a great help for everyone interested in various security issues.